Breakfast used to be a no-nonsense, hassle-free, room-temperature affair around here. Joe had a peanut butter sandwich (on homemade bread of course) and a glass of milk (after his mandatory, wake-up espresso). Donkey Doodle Dandy and the sheep and the llamas were given hay. And not just any hay. All natural, homegrown hay, lovingly put up by yours truly (and Joe) during the hottest freaking part of the year. My breakfast was a piece of fruit and a bowl of organic cereal slurped down between chores. So things were fine, and our morning meal was a happily anticipated affair. Some of us would even jump for joy at the sight of our breakfast, tearing into it with desire and excitement (meals are a highlight of the day!). Now, thanks to Donkey Doodle Dandy's helpful and concerned fans, things have changed. Drastically. One might even say a full out breakfast revolt has taken place on the farm. Following I Gallop On's advice (but not having any small children around from whom to steal a peanut butter sandwich), I took half of Joe's and fed it to Dan. This was fine with Joe, who, after hearing how well apple fritters went over at Heather's household, had already decided that a hot, fresh fritter sounded like a delicious change. It was then strongly suggested to me that vanilla ice cream would surely be a much more fitting source of calcium than his usual glass of milk. Dan thought the peanut butter sandwich was the cat's meow until Kaliblue reminded us that famous donkeys prefer waffles. Dan immediately demanded that from now on his peanut butter sandwich be crisped up in the waffle iron (it should be arriving from Amazon any day). Meanwhile (and I have no idea who to blame this one on), the sheep (all 53 of them--yes, those shameless mothers even got their babies in on the act) unanimously declared that if hay wasn't good enough for Dan, it certainly wasn't good enough for them. ("We're pregnant and nursing for baaing out loud!") They are now holding out for whole grain pancakes made in the shape of stars and hearts (where do they get these ideas?) and smothered in molasses syrup. The prima donna llamas, who pretty much snubbed their noses at our hay (and us) since their first day here, have joined in the revolution and let it be known that they would like crepes, preferably stuffed with lightly sauteed morel mushrooms, since they are just coming into season here. Naturally I am the Head Mushroom Hunter. And Vickie, it does appear that your well-intentioned city girl bribes are simply not up to par. Obviously a plain old apple just will not do, and--leave it to Stacey to remind us--that braised carrots are much better than half-dead limp ones. Who knew? As for me? Well, somebody has to eat the rest of the hay. It's really not that bad (though it does take much longer to chew than cereal), and it should keep me filled up long enough to find some morels, learn to make crepes, buy vanilla ice cream, and figure out how to turn on that "Approve All Blog Comments Before They Appear" setting on Blogger. Who says blogging can't change your life? 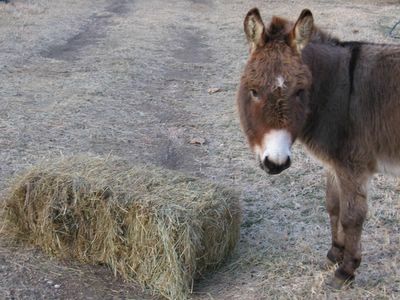 I may be a city girl, farmgirl but I know that donkeys and other citters deserve more than hay! LOL!! Looks your farm has gone all gourmet on us. Next you know we'll all be asked to donate baskets of crossiants with fresh creamery butter and homemade orange marmalade the for lot!! Shall I send the Harry and David catalog for Donkeys, Llamas and Sheep? Oh, and let us not forget the other farm gourmet eaters...dogs, cats and chickens. Perhaps a finely aged Wisconsin cheddar with a nice Chante and a really large Matsu apple sliced ever so thinly placed upon a whole wheat lightly salted cracker? LOLOLOLOL. If those animals eat like that, I think you should upgrade hubby's PBJ! I laughed and laughed all the way thru this post! No wonder you have such an awesome following of farmgirl fans. Hope the rest of your day is as fun filled as this post is. I had to go and follow all those links to older posts too. Such fun learning about the goings on at your farm. Where you lost control was when you let them read the blog! Donkeys, sheep and llamas love hay! Nothing better for them. Nothing tastes better, smells better, makes you feel better! There, now cut off their access. So glad you've enjoyed this, and you definitely have me LOL. I'll have to get back to you later, though. But I don't think I should ignore Lindy at the moment. She is leaving comments all over the place. I knew I was going to hear from you. The truth is, I am a little afraid to even get near your henhouses right now. I don't think I can deal with any more outrageous breakfast requests at the moment. I will remind you, however, that you and Whitey (and those other two chickens) practically eat better than I do. More about that later (perhaps in response to your comment on the compost article). Right now I have to go feed, um, the sheep. You ain't going to be going bckto hay now! But I guess the upside is that you wont have to spend weeks harvesting hay! Viva La Dan Revolution !!!!!! He looks totally disgusted at the hay. Our Dan certainly deserves nothing but the best. Blogging totally changes your life! And for those of us fortunate enough to have you for a blogfriend, it changes it 180 degrees for the better! Happy Breakfast, Susan! Save me one of those whole grain pancakes, will ya? Obviously the person who told you to "get a life" should have been more specific about what kind to look for. Sorry to have started this farm food revolt! Sharing a laugh is one of the best things in the world, don't you think? Thanks for all your kind words. LOLOL! Oh, if it were only that easy. I don't even know how they get online! Did you know Whitey the Chicken somehow even managed to get her own blog? It's always going to be something with you two, isn't it? Not having to put up hay would definitely be blissful. . . But after a few weeks of making fritters, crepes, and pancakes, I'll probably be more than willing to spend a few days sweating over those bales! You are not a good influence. Okay, should I be insulted--or laughing? I'm never quite sure with you. Organic peanut butter, you say. Why am I not surprised? Hmmmm. Good suggestion. I have found that gravy makes everything taste better (unless it's already covered with chocolate). I have a feeling you've dined on a few bales of hay yourself, LOL. Wonderful post -- thanks for the laugh! I'm looking forward to all the recipes you will be posting for innovative and delicious ways to prepare homegrown hay! Hee! We would like tiny bugs en brochette, please. A sprinkle of miscellaneous seeds would not be amiss. "Okay, should I be insulted--or laughing? I'm never quite sure with you." I never insult people who wouldn't understand they were being insulted. Seriously though, I would never insult you. You're my bread baking buddy. I should live such a life as the animals on your farm! Thanks for the laugh-- and breakfast ideas.